Q: How far is Punahoa from the airport? A: Approximately 25 minutes from the airport. Q: Are there stores near you? A: We are within walking distance of grocery stores, gift and clothing shops, gas stations and restaurants. Q: Do you have beach equipment/toys to loan or rent? A: We do not have beach toys/equipment. However, you can rent all types of equipment at local shops within walking distance of Punahoa Beach Resort. We provide beach towels, beach chairs and umbrellas at no charge. Q: Can you see the ocean from the Punahoa? A: Yes! 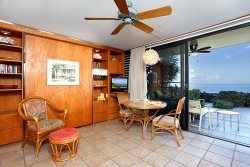 All units have private lanai's that overlook the ocean. Q: Do you have internet connection and parking? A: Both wireless internet & on-site parking are FREE! Q: What about laundry facilities and BBQ’s? A: We have a coin operated laundry room on the ground floor and a BBQ area on the North side of the building. A. Only our two penthouses. All rooms have ceiling fans. Q: Is it safe to drink the tap water? A: We have some of the cleanest, best tasting water around!